I generally don’t have the attention span for museums and, while there are exceptions, I feel like most restored castles are along that same vein. 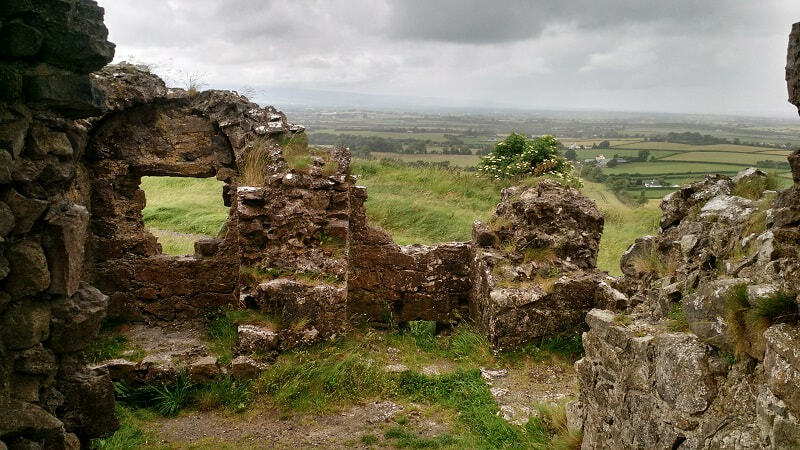 However, I fell in love with abandoned castles on our trip to Ireland. Most of these castles are just there, free to enter, and begging to be explored. You can climb (and with the stairs rotted away sometimes you have to) and wander at your own risk, unhindered by signs or fences. 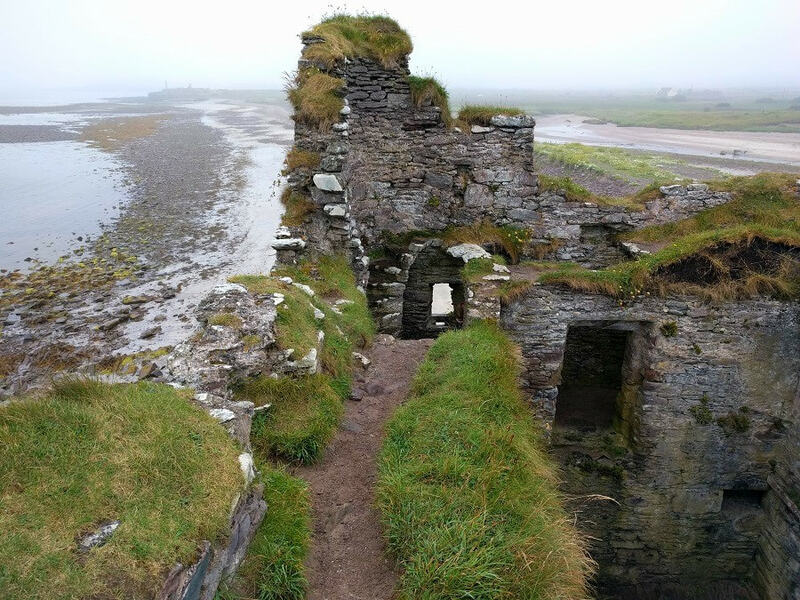 Unlike the restored castles that are constantly under construction, the beauty of decay takes over and adds a life of its own to these abandoned structures. 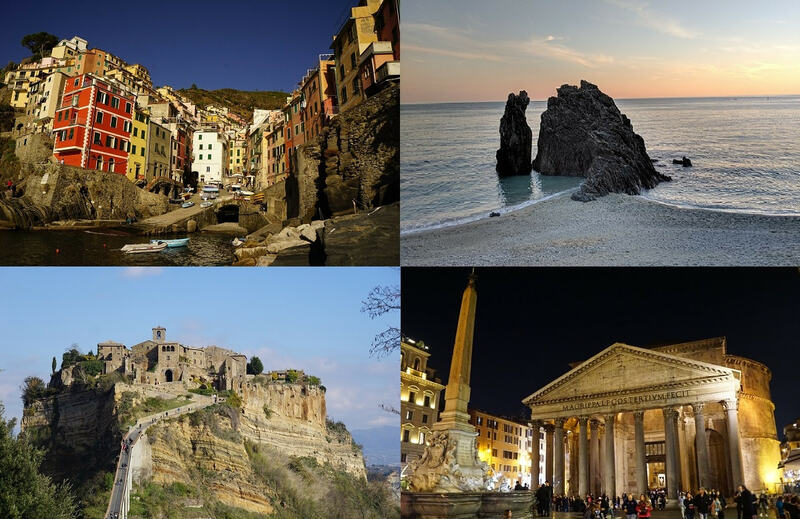 This list is not comprehensive and not necessarily the best, just the ones we visited on our one week road trip. We thoroughly enjoyed all of these and felt that each one was unique enough to be worth visiting. Please remember to be respectful - Leave these places as you found them for the next visitors to enjoy. Explore at your own risk - Be careful and aware of your surroundings. There are no handrails, warning or safety of any kind. This is part of what I love about visiting these sites, but doesn’t mean that they are necessarily safe. Flashlight - A head lamp would be best so you can move around hands free. Several of these have dark passages with stairs and Ballycarbery has a basement. 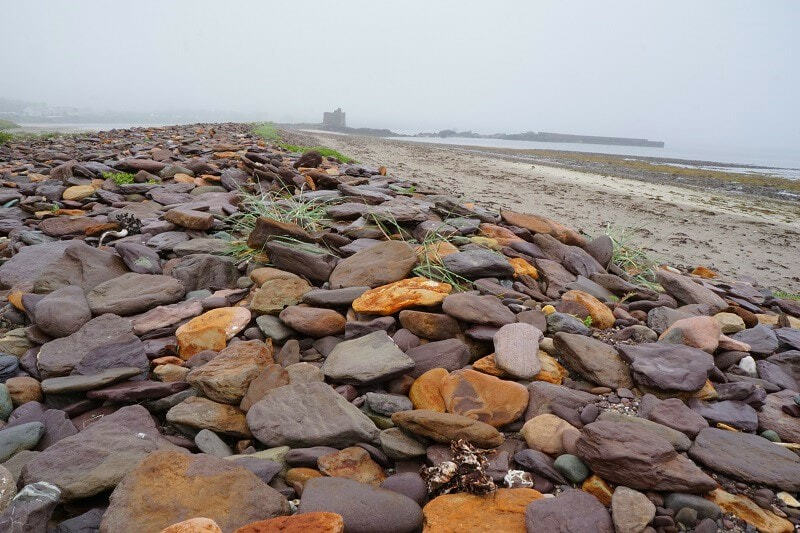 Shoes - Regular sneakers will work but if you intend to climb to the upper levels of Ballinskellig or Ballycarbery Castle you may want something with a little more grip because it can be slick. You may want to consider waterproof shoes for Ireland to stay comfortable. 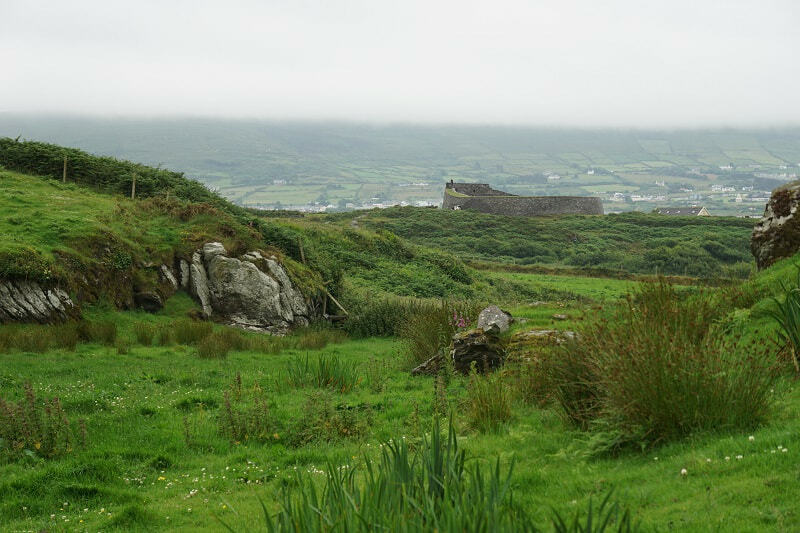 Being Ireland, if it isn’t raining now it either just did or will soon, and the grass will be wet. We wore Columbia Hiking Shoes which were rugged and were a good value. Now we have Salomon Hiking Shoes and Mizuno Trail Running Shoes, which are lighter and more breathable. 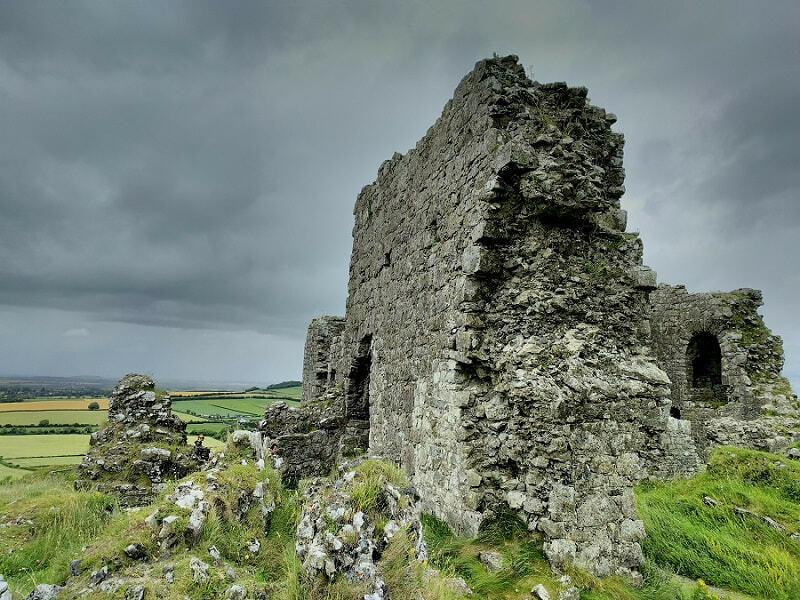 The Dunamase Castle is only an hour from Dublin and just off the highway, however, it gets relatively few visitors. If you are traveling between Dublin and Cork, the Ring of Kerry, Limerick, or southern Ireland you will probably pass right by it. 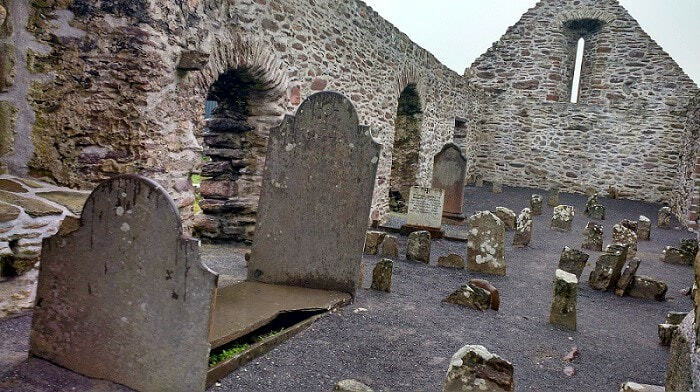 You park at the bottom by the little church and climb up the hill to visit these ruins. There is a small plaque with a bit of history by the start of the path. This castle takes a bit of imagination to piece back together in your mind. There are bits of the once grand fortress everywhere, but much of it is toppled over and fragmented. It is like a life size puzzle. You can wander around the large hilltop and try to imagine how it once was. Most of the stairs are completely gone here, so there isn’t much you can easily climb, but it is a fun maze of crumbling walls. From the top, why they built here is no puzzle at all. You can see for miles in every direction. There would be no such thing as a surprise attack here. Now you can watch the wind make waves across the fields and the clouds chase each other casting walls of darkness on the land below. It can be mesmorizing. Off the beaten path without being out of the way, this isolated peninsula makes the perfect picnic stop. This was our first sightseeing stop of the trip; just a short detour on our way from the Dublin airport to Portrush. There is not much left of this castle but there are some images to help you imagine how it once was. This is no fairy tale castle, but it is everything that I feel Ireland should be. Isolated, green, majestic, pristine, and ancient, with a touch of rain. Even after traveling around the whole country we still felt that this was a special spot. 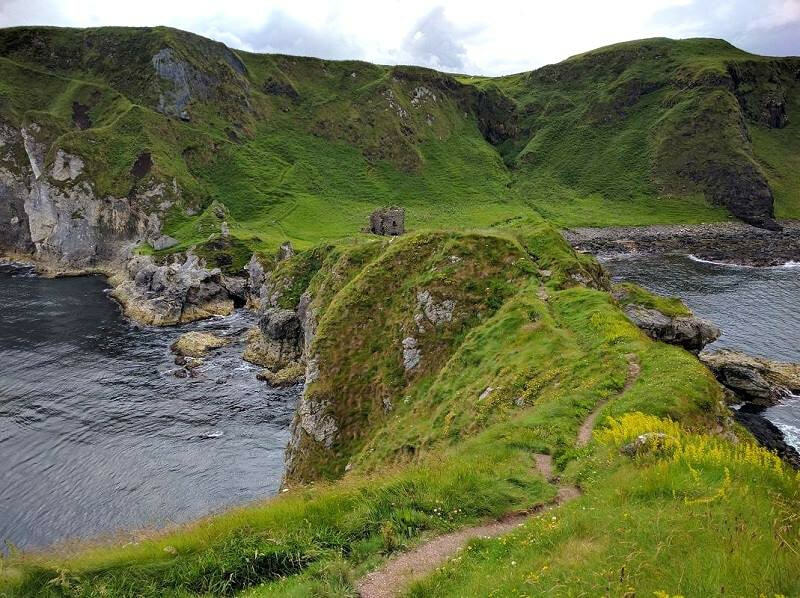 Check out my Kinbane Castle Article for everything you need to know to visit this magical spot. This fortress is small and located out on a uniquely situated peninsula. 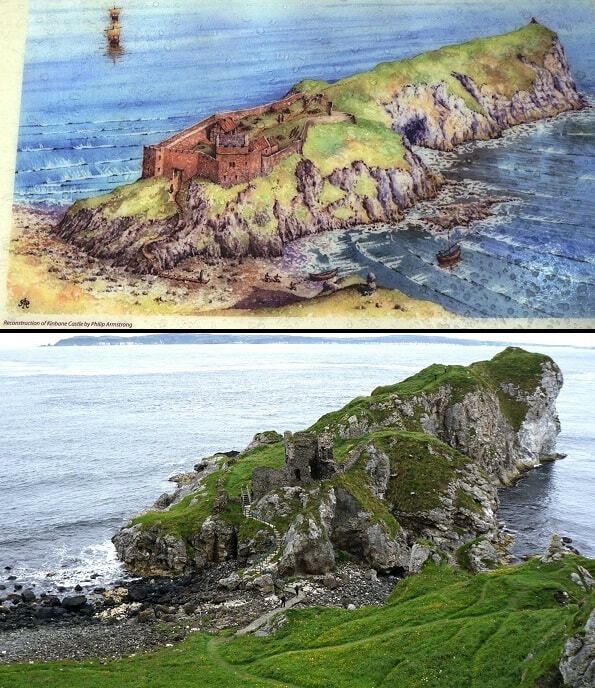 It seems like an ideal spot defensively and a very hard place to hold a seige against, with the water and land as an escape route. However, I imagine it also must have been a harsh place to live. While the setting is dramatic, this one doesn’t appear to be much from a distance. The rain was picking up and we almost turned back to the car, but we are very glad we didn’t. The small courtyard is surrounded by two sets of walls with a couple staircases running up to different levels with windows here and there. It is amazing how much they packed into this tiny structure. The turf has grown on the upper floors and makes the place feel alive. Ballinskellig Castle definitely had the playground feel. There were passageways in the walls connecting different areas and some places you could only get to from one side and not the other. Each time we came to an opening we would look out to see where we were, like one of those mazes of tubes. It might have been because of the weather, but we had the entire place to ourselves. This abbey is located just down the beach from this castle and is worth a visit as long as you are there. Of the places we visited this one required the most caution and skill due to its size and condition. Looking around you can see the battle between the man-made castle and nature slowly being won by the vegetation. It is interesting to see how something this size can slowly melt away. 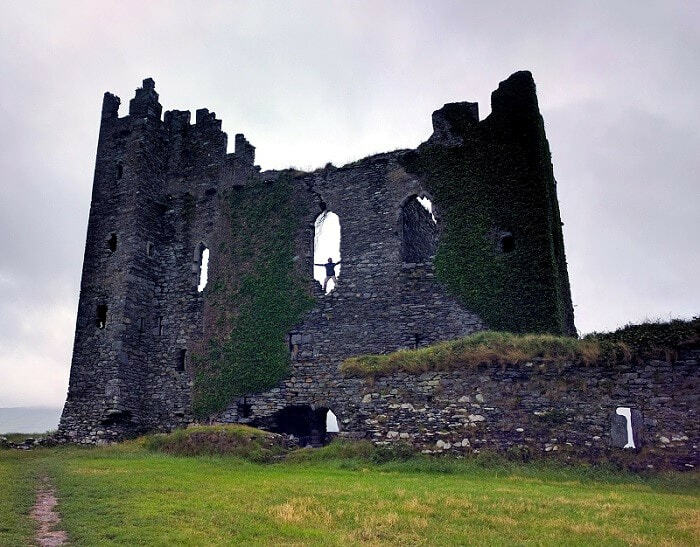 Ballycarbery Castle must have been imposing in its day, because even what remains of it looks intimidating. 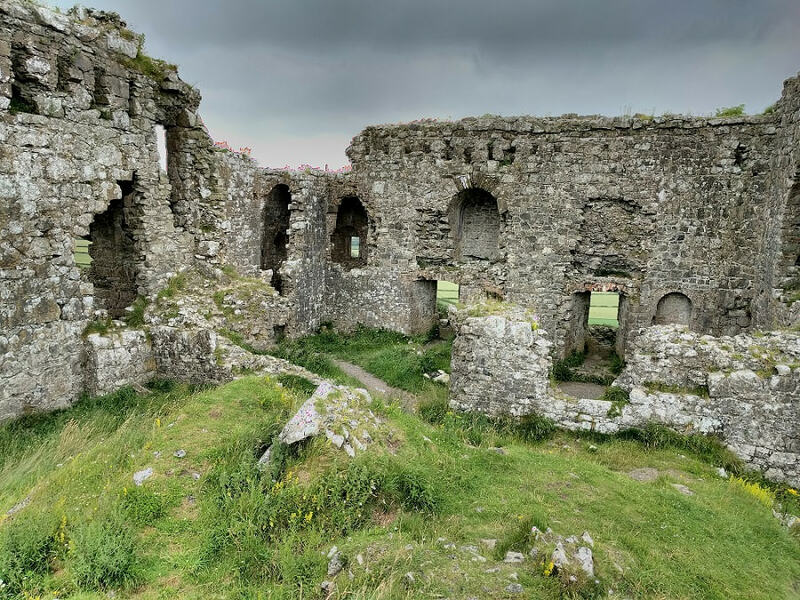 This castle is pretty easy to find, and you will even see it from the neighboring sites, but strangely it is not listed on the Google Maps (at least as of March 2019). When you pull up to it there is a small dirt parking area and a plaque. We went in the late afternoon and there was only one other vehicle there. Most people go counter clockwise and see this area in the morning. This castle has several levels, including a basement that may or may not be open. The stairs to the main level were partially gone so we got to do a little climbing to get up there, but it was pretty easy. The main level is so built up with grass that it is hard to tell where the floor stops. There is hole in one area where you can look down into the basement which looks like it used to be a large hall. There was another staircase you could climb to get a bit farther up into the tower. If you haven’t seen a ring fort before you should definitely check these out. They are right across the field, although they have a different parking area. You can see both ring forts from the castle if you know where to look and can see the castle from the forts. 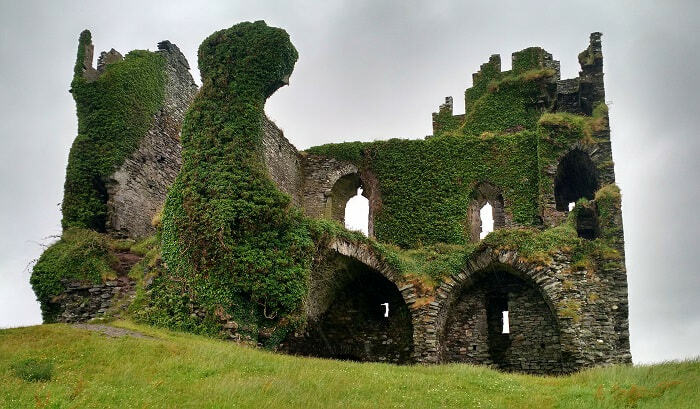 Did I miss an abandoned castle in Ireland that you loved?